The eyelids are often affected by a variety of lesions. Most eyelid lesions are of benign origin, but some eyelid lesions may be malignant. It is estimated that of all benign and malignant lesions of the eyelid, roughly 35% are comprised of basal cell carcinoma and squamous cell carcinoma. Malignant melanomas are responsible for only 1% of all eyelid lesions. The importance of this lies in the fact that, although only 3% of all skin cancers are melanomas, more than two thirds of all deaths from skin cancer are attributable to malignant melanoma. Therefore, it is important to recognize benign and malignant lesions of the eyelid, especially when pigmented. See the images below. 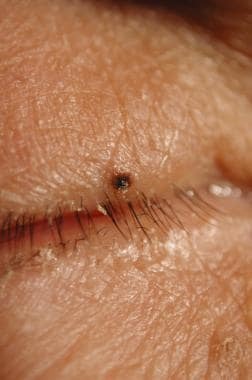 Lentigo maligna or superficial spreading melanoma of the eyelid. Courtesy of Joel Sugar, MD. Focal melanoma of the upper lid in a patient with history of prior excised conjunctival melanoma. Courtesy of M Duffy, MD, PhD. Change in size or pigmentation of an eyelid lesion is significant in the history. Suspicious eyelid lesions, particularly when they are pigmented, need to be removed for purposes of a biopsy. 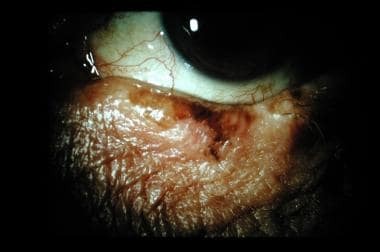 Although a pigmented eyelid lesion may appear benign, it is wise to obtain a specimen for pathological examination because of the associated risk of mortality associated with malignant melanoma. Pigmented lesions in infants and small children may pose a significant risk of sight loss. This is particularly true with capillary hemangiomas, cavernous hemangiomas, and giant hairy nevi. Pigmented lesions in infants and children also may be associated with pathology in contiguous structures or associated with systemic disease. These lesions should alert the ophthalmologist that further investigation may be needed. This is particularly true with such lesions as cavernous hemangioma, lymphangioma, and juvenile xanthogranuloma. The frequency of pigmented lesions of the eyelid varies according to the lesion type and patient characteristics. Certain lesions are seen only in infants and small children, while others are seen only in elderly persons (seborrheic keratosis). Environmental characteristics play a role, with the frequency of benign and malignant eyelid lesions increasing in areas closer to the equator. Pigment-producing cells derive embryologically from the neural crest. These cells are destined to reside in the basal cell layer of the epidermis. Melanocytes are melanin-producing cells found in the basal cell layer of the epidermis. Nevus cells are incompletely differentiated melanocytes that are found in clumps in the epidermis or the dermis. Nevus cells may or may not produce pigment and, therefore, can be classified as melanotic or amelanotic. Nevi (moles) can be congenital or acquired. Congenital nevi acquire pigmentation at puberty, at which time they slowly migrate from the epidermis to the dermis. Coincident with this decent, nevi become less active and, therefore, less capable of converting into a malignant lesion. The most active nevus is the junctional nevus. This resides at the epidermal/dermal border and is the most likely of all nevi to convert to a melanoma. As nevi descend further into the dermis (compound and intradermal nevi), they become relatively inactive and, thus, incapable of malignant transformation. Melanomas arise from epidermal melanocytes and represent less than 1% of all eyelid tumors. It can occur in 1 of the 3 following forms: superficial spreading malignant melanoma, lentigo maligna melanoma, and nodular melanoma. Lentigo maligna is the premalignant form of lentigo maligna melanoma. This is found on the face of elderly patients and is related to exposure to the sun. Once this lesion penetrates into the dermis, it is classified as a lentigo maligna melanoma. Lentigo maligna melanoma is responsible for 90% of all head and neck tumors. Melanocytes produce melanin and are derived from neural crest cells. Pigmented lesions of the eyelids arise from 1 of 3 types of melanocytes, as follows: (1) epidermal or dendritic melanocytes, (2) nevus cells or nevocytes, and (3) dermal or fusiform melanocytes. Freckles: These lesions are small (1-3 mm in diameter) tan-to-brown macules originating from epidermal melanocytes. They occur more commonly in light-skinned individuals and darken with sun exposure. These lesions reflect melanocyte overactivity, not proliferation. Lentigo simplex: These lesions arise from epidermal melanocytes and may appear on skin and mucous membranes as brown macules. They usually appear in childhood, are unaffected by sun exposure, and are associated with Peutz-Jeghers syndrome. Solar lentigo: These tan-to-brown macules are found commonly in sun-exposed areas of older individuals and in patients with xeroderma pigmentosum. Lesions usually have irregular borders and slowly increase in size. Melasma: Melasma is a skin condition that is characterized by the development of irregularly shaped skin areas containing varying shades of brown pigmentation. It most commonly occurs on the sides of the face, the forehead, the upper lip, the chin, and the sides of the neck. Frequently, melasma is associated with pregnancy or the use of oral contraceptives, but melasma can occur in men. Most pregnancy-associated cases fade away following delivery, eventually clearing within a few months. Melanocytic nevus: They frequently occur on the eyelid skin and on the eyelid margins. The clinical appearance often is predictive of histologic type (see Histologic Findings). Lesions typically present in childhood as small, flat tan macules that increase in size. As the lesion increases in diameter, a nest of cells drops of into the dermis; then, a compound nevus is formed. They are elevated slightly and pigmented. Intradermal nevus are dome-shaped, pedunculated, or papillomatous and usually are less pigmented or amelanotic. Spindle-epithelioid cell nevus: Also termed juvenile melanoma or Spitz nevus, spindle-epithelioid cell nevus is a pink-to-orange dome-shaped nodule occurring in children and young adults. Balloon cell nevus: They are lightly pigmented, elevated lesions that are usually less than 5 mm in diameter. No clinical features are used to make the differential diagnosis with the other nevocellular nevi. Nevus of Ota: These nevi are blue-to-purple lesions with mottled discoloration of the skin in the distribution of the ophthalmic and maxillary divisions of the trigeminal nerve. Nevus of Ota frequently is associated with ipsilateral ocular melanocytosis involving the conjunctiva, sclera, and uveal tract. Blue nevus: These nevi are solitary, blue nodules that are less than 1 cm in diameter. Cutaneous malignant melanoma: Lentigo maligna is a tan or brown macular lesion with irregular borders and is the premalignant stage of lentigo maligna melanoma. Superficial spreading melanomas present as a brown, irregularly shaped macule. Nodular melanomas typically are dark brown or black nodules or plaques (rare on eyelids). See the image below. Any pigmented lesion that shows growth is suggestive of malignancy, and a biopsy should be performed. Particular characteristics that are suggestive of malignant transformation are irregular borders, changes in color, asymmetry, ulceration, or bleeding. Pigmented lesions in childhood that cause disruption of images to the retina and are amblyogenic should be treated surgically. Eyelid skin, although thinner, is continuous with and, therefore, histologically identical to skin in other parts of the body. The dermis contains a collagen matrix with vascular channels and dermal appendages. The epidermis contains a basal cell layer where melanocytes reside. The eyelid margin is continuous with the palpebral conjunctiva. Pigmented lesions can arise on the eyelid or eyelid margin. Margin tumors should arouse the suspicion of a conjunctival neoplasm. The propensity of pigmented lesions to arise on the eyelid is related to the actinic exposure of the area. No contraindications to surgery are known. Kirzhner M, Jakobiec FA. Clinicopathologic and Immunohistochemical Features of Pigmented Basal Cell Carcinomas of the Eyelids. Am J Ophthalmol. 2011 Oct 6. [Medline]. Chowchuen B. Long-term outcomes of surgical management in the patients with facial congenital melanocytic nevi. J Med Assoc Thai. 2011 Dec. 94 Suppl 6:S70-8. [Medline]. Kirzhner M, Jakobiec FA. Clinicopathologic and immunohistochemical features of pigmented Basal cell carcinomas of the eyelids. Am J Ophthalmol. 2012 Feb. 153(2):242-252.e2. [Medline]. Moesen I, Duncan M, Cates C, Taylor A, Wintle RV, Ismail A, et al. Nitrous oxide cryotherapy for primary periocular basal cell carcinoma: outcome at 5 years follow-up. Br J Ophthalmol. 2011 Dec. 95(12):1679-81. [Medline]. Esmaeli B, Youssef A, Naderi A, et al. Margins of excision for cutaneous melanoma of the eyelid skin: the Collaborative Eyelid Skin Melanoma Group Report. Ophthal Plast Reconstr Surg. 2003 Mar. 19(2):96-101. [Medline]. Pang AL, Wells K. Bilateral Anterior Uveitis after Intense Pulsed Light Therapy for Pigmented Eyelid Lesions. Dermatol Surg. 2008 Jun 12. [Medline]. Boulos PR, Rubin PA. Cutaneous melanomas of the eyelid. Semin Ophthalmol. 2006 Jul-Sep. 21(3):195-206. [Medline]. Glat PM, Longaker MT, Jelks EB, et al. Periorbital melanocytic lesions: excision and reconstruction in 40 patients. Plast Reconstr Surg. 1998 Jul. 102(1):19-27. [Medline]. Haim T, Meyer E, Kerner H, et al. Oculodermal melanocytosis (nevus of Ota) and orbital malignant melanoma. Ann Ophthalmol. 1982 Dec. 14(12):1132-6. [Medline]. Kaeser PF, Uffer S, Zografos L, et al. Tumors of the caruncle: a clinicopathologic correlation. Am J Ophthalmol. 2006 Sep. 142(3):448-55. [Medline]. McCarthy SW, Scolyer RA. Melanocytic lesions of the face: diagnostic pitfalls. Ann Acad Med Singapore. 2004 Jul. 33(4 Suppl):3-14. [Medline]. Nik NA, Glew WB, Zimmerman LE. Malignant melanoma of the choroid in the nevus of Ota of a black patient. Arch Ophthalmol. 1982 Oct. 100(10):1641-3. [Medline]. Roy PE, Schaeffer EM. Nevus of Ota and choroidal melanoma. Surv Ophthalmol. 1967 Apr. 12(2):130-40. [Medline]. Sagebiel RW, Chinn EK, Egbert BM. Pigmented spindle cell nevus. Clinical and histologic review of 90 cases. Am J Surg Pathol. 1984 Sep. 8(9):645-53. [Medline]. Traboulsi EI, Maumenee IH. Periocular pigmentation in the Peutz-Jeghers syndrome. Am J Ophthalmol. 1986 Jul 15. 102(1):126-7. [Medline].